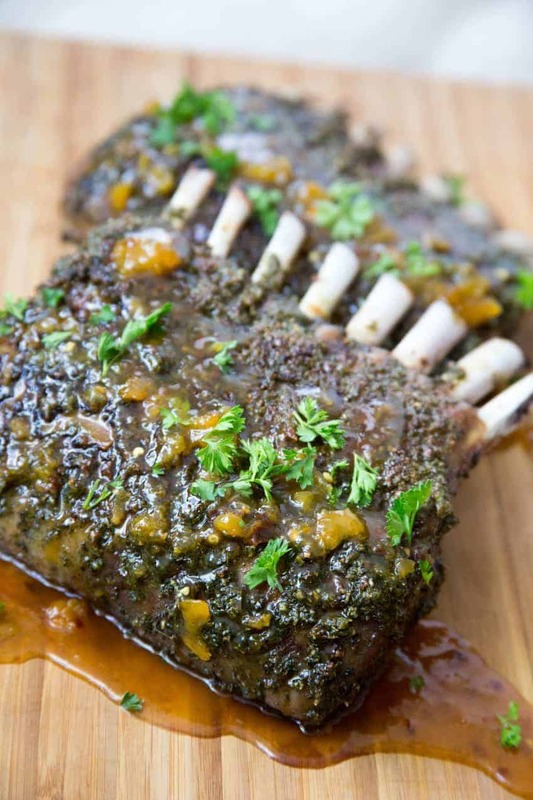 Roasted Rack of Lamb is easier than you think! 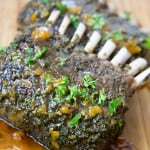 This Lamb Chops with Spicy Apricot Sauce Recipe is impressive, delicious, and easier than you think! Just marinate the meat with a rub for a few hours, roast in the oven, and done! The spicy apricot sauce is addictive and super-simple too. Racks of lamb make for a beautiful dinner presentation when displayed whole. If you prefer, you can slice them and lay the chops over pilaf or soft polenta. The single chops are also perfect appetizers when served on a platter, guests can pick them up right by the bone. I call them “lamb lollipops” and they move fast. 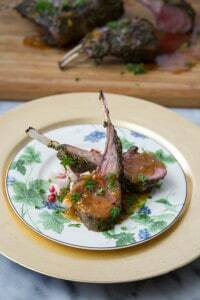 I definitely suggest that you serve these Lamb Chops with Spicy Apricot Sauce for Easter dinner. Your guests will assume you spent the whole day slaving away in the kitchen. The reality is, you’ll have plenty of time to drink a few glasses of pre-party bubbly on the couch. Cheers! 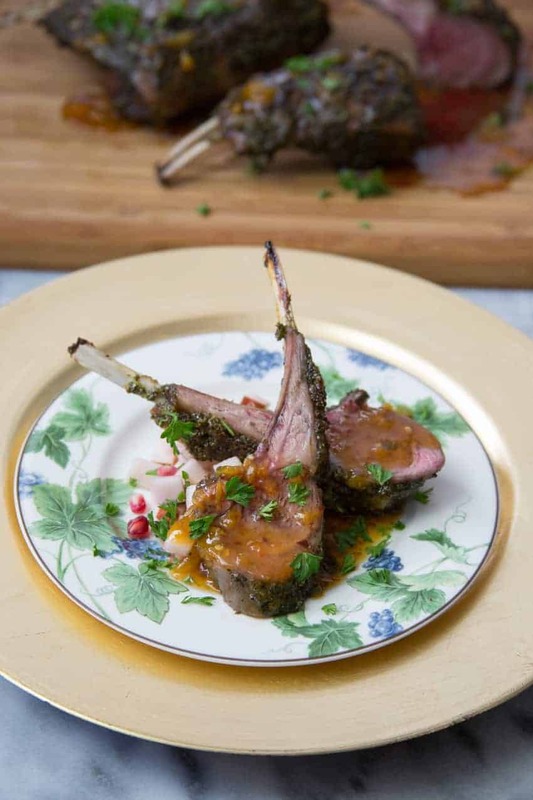 These Lamb Chops with Spicy Apricot Sauce are impressive, delicious, and easier than you think! Just marinate the meat with a rub for a few hours, roast in the oven, and done! The spicy apricot sauce is addictive and super-simple too. Place the first 5 ingredients together in a blender or food processor and pulse with 2-3 tbsp olive oil until a paste forms. On a rimmed sheet pan, coat the lamb with the paste, cover with plastic wrap and allow to marinate in the refrigerator for at least 4 hours (24 is best). Preheat your oven to 400 degrees. Place the lamb rack on a parchment-lined sheet pan, and bake for 12-15 minutes for medium-rare. Remove from the oven and allow to rest for 10 minutes before carving. While the meat is cooking, add all of the sauce ingredients to a saucepan over medium heat, and stir to combine. Simmer to reduce by half, about 8-12 minutes. Taste the sauce and add more pepper flakes or salt as needed. Serve lamb chops with sauce drizzled over the top and enjoy. This entry was posted in Featured, Main Dishes, Recipes and tagged candied lamb chop, celiac disease, dinner, G-Free Foodie, gluten free, gluten free cooking, gluten free food, kc cornwell, lamb, lamb chops, rack of lamb. Bookmark the permalink.